Also, as the twitter feed says, Amazon S3 support is coming. I just started using S3 and so far I’m very impressed with the speed and performance. I should also give a shout-out to LitS3, which is an excellent C# library for S3 access and is the backbone for S3 operations in Fragment Sync. I came across ConnectCode Software Box Shot Maker on CodeGuru, meant as a demo of C# and Windows Presentation Foundation. It’s a pretty cool app, and I played around with it for a few minutes and did a box shot of Fragment Sync. Anti-aliasing would have been nice, but I did a quick bit of supersampling by reducing the original screenshot by half. 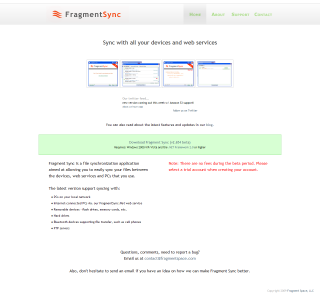 The Fragment Sync blog is up. 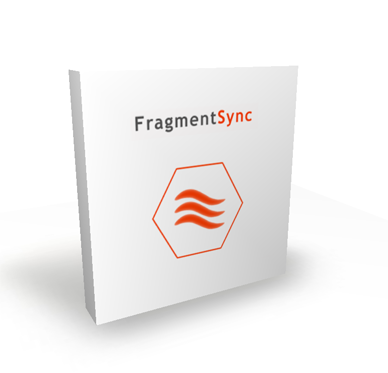 Up first is a series of posts about the history of Fragment Sync development, from its original incarnation as Firesync to what it is now. It’ll also give me a chance to present some of the design and technical decisions that went into making Fragment Sync and explain what sets it apart from many of the existing sync solutions out there. These were posted a while back on the Fragment Sync site. You are currently browsing the archives for the Fragment Sync category.